Metallic iron is silvery white in colour, occurring naturally as haematite, magnetite, etc. and usually causes no problems. · Metallic iron is silvery white in colour, occurring naturally as haematite, magnetite, etc. and usually causes no problems. In fact it is an essential element and deficiency results in anaemia. Even if there is more than the required intake daily, the excess is excreted. But in some individuals with inborn errors, even normal dietary iron can cause toxic effects due to accumulation, e.g. haemochromatosis (bronze diabetes). · Various iron salts are administered therapeutically in indi-viduals with iron deficiency anaemia which can result from a wide variety of causes. Iron poisoning is related in most instances to overdose of such salts. One of the commonest is ferrous sulfate (green vitriol) which occurs as bluish greenis ferrous sulfate (green vitriol) which occurs as bluish green crystals (Fig 9.19). Iron (ferric) oxide, i.e. rust does not cause iron poisoning. · Iron is found in 5.1% of the earth’s crust. It is the second most abundant metal, and the fourth most abundant element. It is believed that the earth’s core consists mainly of iron. · Iron is primarily used in powder metallurgy and serves as a catalyst in chemical reactions. · Iron is a component of carbon steels, cast iron, high-speed steels, high-strength low-alloy steels, manganese alloy steels, and stainless steels. · Steel is the most important alloy of iron. It contains 0.25–2% of carbon. Alloyed with carbon (C), manganese (Mn), chromium (Cr), nickel (Ni) and other elements, iron is used to form steel. · Wrought iron is almost pure iron. · Iron uses include magnets, dyes, pigments, and abrasives. · Iron is essential to life. It is a constituent of biolog-ical pigments such as haemoglobin, cytochromes and ferrichromes. · Commonly used iron salts in therapeutics along with respective iron content are mentioned in Table 9.8. · The amount of iron in a particular iron salt (e.g. sulfate, gluconate, fumarate, etc.) is not the same. Take the total molecular weight of iron in the compound, and divide it by the molecular weight of the compound and multiply by 100. Multiply the total number of milligrams of the compound ingested by the percentage of iron in the compound. Another fast method to remember the approximate amount of iron in a preparation is FSG:359. This means the amount of ferrous Fumarate divided by 3; Sulfate divided by 5 and Gluconate divided by 9 is the amount of elemental iron in the prepara-tion. · The usual fatal dose corresponds to about 200 to 250 mg of elemental iron per kg of body weight. This can be calculated from the percentage of elemental iron in a particular prepara- tion, e.g. a single 150 mg tablet of anhydrous ferrous sulfate which contains 37% of elemental iron will contain a total of 55 mg of elemental iron. But such calculations can be misleading since serious hepatotoxicity can result at much lower concentra- tions of iron in the body which can lead to death. In practice, this can be as low as 60 mg of elemental iron/kg. Hence just a handful of these tablets (15 to 20 in number), can be lethal to a young child. Iron poisoning occurs when serum iron level exceeds the total iron-binding capacity (TIBC), resulting in free circulating iron in the bloodstream. · Massive postarteriolar dilatation which results in venous pooling. · Increased capillary permeability resulting in decreased plasma volume. · Oxidation of ferrous to ferric iron releasing hydrogen ions. Subsequent hydration of ferric iron results in metabolic acidosis. · Inhibits mitochondrial function leading to hepatic damage, hypoglycaemia, and hypoprothrombinaemia. · Inhibits thrombin-induced conversion of fibrinogen into fibrin. · Has a direct corrosive action on the GI mucosa. · Stage I (0.5 to 2 hours) includes vomiting, haematemesis, abdominal pain, diarrhoea, haematochezia, lethargy, shock, acidosis, and coagulopathy. Necrosis to the GI tract occurs from the direct effect of iron on GI mucosa. Severe gastro- intestinal haemorrhagic necrosis with large losses of fluid and blood contribute to shock. Free iron and ferritin produce vasodilatation that may also contribute to shock. · CNS depression, and metabolic acidosis have been reported. · Stage IV (2 to 4 days) includes possible hepatotoxicity, convulsions, and coma. Thought to be a direct action of iron on mitochondria. Monitor liver function tests and bilirubin. Acute lung injury may also occur. o The primary site of hepatic injury is the periportal areas of the hepatic lobule (the principal site for hepatic regeneration), which may explain the increase in mortality and poorer prognosis. Iron induced hepato- toxicity is a presumed result of free radical generation and lipid peroxidation. Iron catalyses hydroxyl radical formation (the most potent-free radical), which initiates lipid peroxidation. Based on limited data, antioxidants may have a hepatoprotective role in iron poisoning. · Stage V (days to weeks) includes GI scarring and strictures. GI obstruction secondary to gastric or pyloric scarring may occur due to corrosive effects of iron. Evaluate with barium contrast studies. Sustained-release preparations have resulted in small intestinal necrosis with resultant scarring and obstruction. These stages of iron poisoning may not occur in all patients. After massive overdose, patients may present in shock. With less serious overdoses, the initial gastrointestinal symptoms may be the only findings to develop even without treatment. · X-ray: Like all other heavy metals, iron and its compounds are radiopaque. However, chewable iron tablets and liquid iron formulations are usually not visualised on x-ray. Completely dissolved iron tablets/capsules may also not be radiopaque. · Serum iron level: Poisoning is indicated if this exceeds 150 mcg/100 ml, and serious toxicity is usually associated with levels beyond 500 to 600 mcg/100 ml. Peak levels are seen around 4 hours after ingestion. Measuring the total iron binding capacity and relating it to the serum iron level is often misleading and unreliable. · Total leucocyte count (TLC), electrolytes, glucose, blood gas, clotting studies, liver function and renal function tests are useful estimates. · Chelation challenge test: Desferrioxamine in a dose of 25 mg/kg (maximum 1 gm) is given IM. If the serum iron has exceeded iron binding capacity, the excess iron is chelated to desferrioxamine and the complex is excreted as a pinkish (vin rosé) colour in the urine (Fig 9.20). But a negative result does not rule out iron poisoning. · Qualitative desferrioxamine colour test (QDCT): 2 ml of gastric fluid and 2 drops of 30% hydrogen peroxide are placed in 2 plastic tubes. 0.5 ml of solution of desferriox-amine (500 mg in 4 ml distilled water) is added into one tube and the resulting colour change is compared with the other tube (control). If the test is positive, an orange to red colour will develop in the tube in which desferrioxamine was added. The test must be done within 2 hours of inges-tion of iron. · Stomach wash with normal saline performed gently may be of benefit in massive ingestions. Desferrioxamine must not be used for lavage. · Activated charcoal is ineffective. · Magnesium hydroxide solution (1%) administered orally may help reduce absorption of iron by precipitating the calcium carbonate containing antacids may safely be used in therapeutic doses to help reduce iron absorption. · Obtain serum iron levels, creatinine, electrolytes, bloodhaemoglobin concentration, blood prothrombin time, base line liver function tests, and arterial blood gases in seriously poisoned patients. · Correction of hypovolaemia, and metabolic acidosis. o More than one episode of vomiting or diarrhoea. o Significant abdominal pain, hypovolaemia, or acidosis. o Multiple radiopacities on abdominal radiograph. o Serum iron level greater than 350 mcg/100 ml. · Chelation can be done either with desferrioxamine (parenteral) or deferiprone (oral). · Intravenous Dose: Administer by continuous infusion at a rate of up to 15 mg/kg/hr. Faster rates or IV boluses may cause hypotension in some individuals. Infusion rates up to 35 mg/ kg/hr have been used in children with severe overdoses without adverse effects. · Intramuscular Dose: Administer 90 mg/kg, up to a maximum of 1 gm/dose, every 8 hours as are often experienced. · Total Daily Dose: The recommended total intra- venous or intramuscular daily dose should not generally exceed 6 grams. · Duration of Infusion: Duration of infusion is guided by the patient’s clinical condition. Patients with moderate toxicity are generally treated for 8 to 12 hours, those with severe toxicity may require desferrioxamine for 24 hours or longer. Patients should be re-evaluated for evidence of recurrent toxicity (hypotension, metabolic acidosis) several hours after the infusion is discontinued. Infusion duration of greater than 24 hours has been associated with the development of ARDS. · Therapy Endpoint/Colour Change: Monitor urine for characteristic pink to orange-red colour (“vin rose”) indicating the excretion of ferrioxamine (chelated iron) although frequently a urine colour change is not seen. 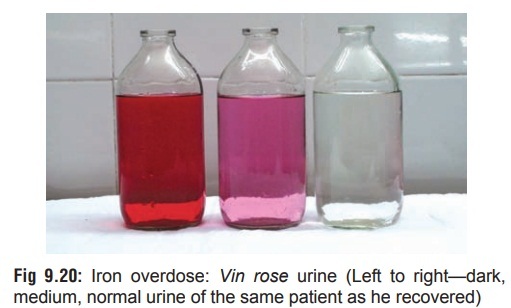 In patients who demonstrate a colour change, desferriox- amine therapy may be discontinued when the urine loses the “vin rose” colour, indicating a decrease in concentration of chelated complex, if the patient is generally asymptomatic. · Sepsis: The use of desferrioxamine in iron-over- dosed children has been associated with Yersinia enterocolitica septicaemia and mucormycosis. In such circumstances desferrioxamine may have provided the iron siderophore complex growth factor needed by the bacteria to induce overgrowth. · Visual Toxicity: Continuous intravenous administration of desferrioxamine, often in the presence of low iron stores, has produced visual toxicity (decreased visual acuity, night blindness, colour blindness, retinal pigmentary abnormalities). Visual toxicity has also been associated in patients with rheumatoid arthritis and chronic renal failure. The mechanism remains unclear. · Ototoxicity: In one study, some patients receiving desferrioxamine had abnormal audio-grams, with a few requiring hearing aids. Risk factors include desferrioxamine dose, duration of therapy and the presence of a low serum ferritin. · Pulmonary Toxicity: A “pulmonary syndrome” has been associated with high dose IV (10 to 25 mg/kg/hr) desferrioxamine therapy for several days for acute and chronic iron overload patients. Features include severe tachypnoea, hypoxaemia, fever, eosinophilia, preceding urticaria, and pulmonary infiltrates. · Hypotension appears to be rate related. One study has suggested that intravenous desferriox-amine be administered at a dose NOT to exceed 15 mg/kg/hr. At present, a safe administration rate has not been established and is based on empiric data. · Renal Toxicity: Elevated creatinine levels and decreased creatinine clearances have been reported. · Continuous arteriovenous haemofiltration (CAVH) may be helpful in severe poisoning. · Liver transplantation is the only therapeutic avenue open in the presence of fulminant hepatic failure. · Haemorrhagic necrosis of gastric mucosa. In ferrous sulfate poisoning, gastric contents may appear bluish green in colour. Acute iron poisoning has assumed grave significance in recent years and cases of accidental poisoning are being reported with alarming frequency in young children. Since most iron preparations (syrups and tablets) are brightly coloured and pleasantly flavoured, they constitute an irresistible, fatal attrac-tion for these innocent victims. To compound the tragedy, in several instances the parents themselves are ignorant about the toxicity of these preparations and tend to dismiss them as “harmless vitamins”. It is imperative that public awareness be generated about the treacherous lethality of iron preparations. Introduction of childproof containers would be very effective in minimising inadvertent ingestions by children as demonstrated by the Western experience.